Fabric Mart Fabricistas: Made by a Fabricista: Parrot Green Jalie City Coat. 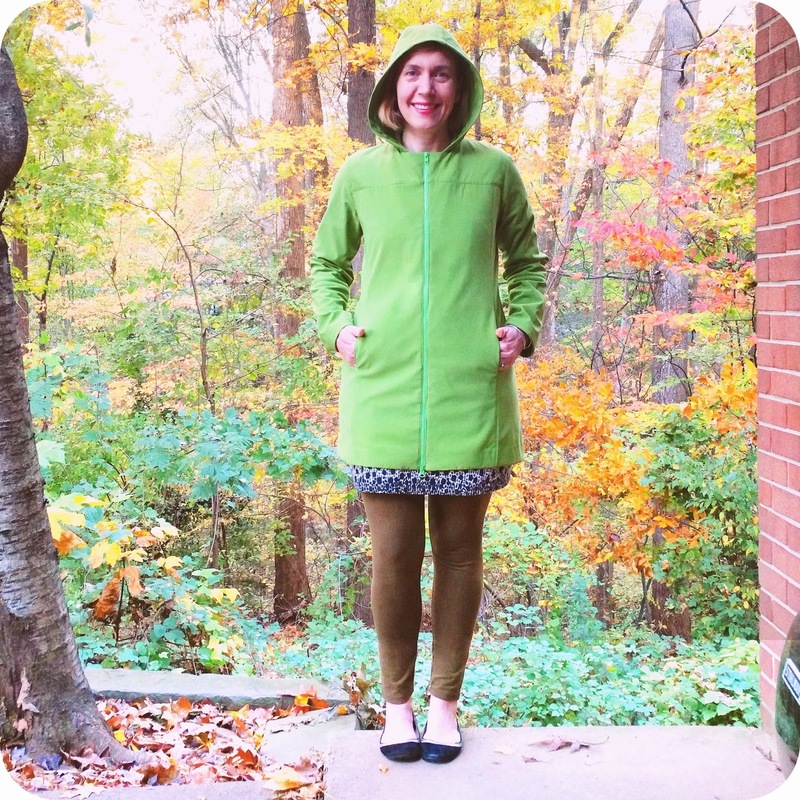 Made by a Fabricista: Parrot Green Jalie City Coat. 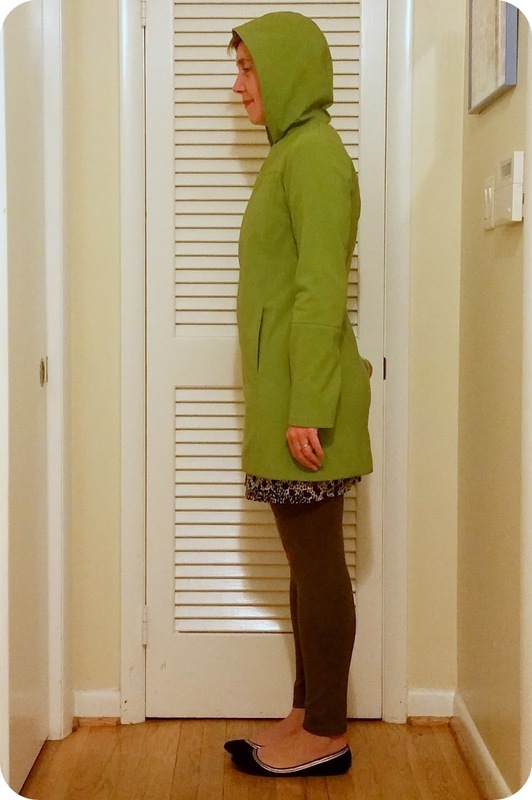 I go through my coat closet every year, and I always see the same thing…gorgeous coats of all sorts of colors and styles (I am definitely a coat junkie! 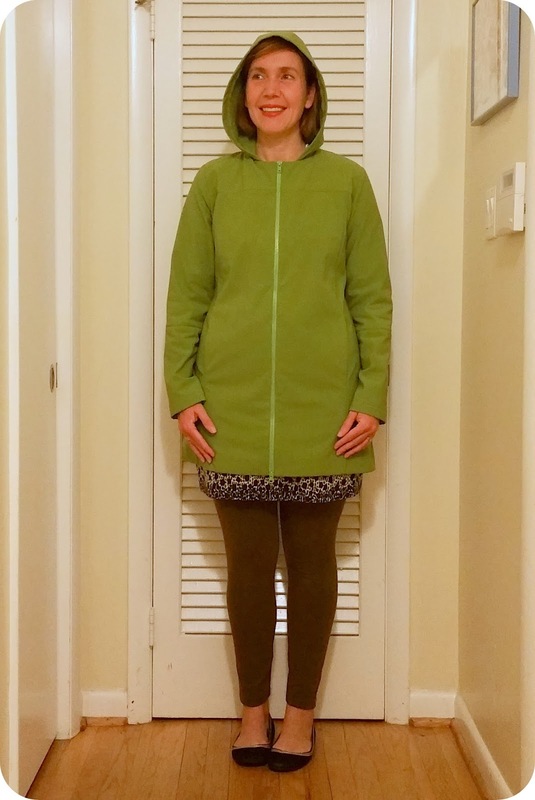 ), but one thing I definitely find lacking is good rainwear. So when I was asked what I wanted to make for November, I toyed around with making a raincoat. I know that the fabric that comes and goes at Fabric Mart doesn’t necessarily mean there will be the right fabric for the job, but at the moment I chose to do this project, there was an overabundance of water repellent fabric at the shop. This fabric is pretty special, though. It isn’t like oilcloth, which is like a stiff, coated cotton, or like the rain resistant canvases, which can be heavy and sort of inflexible. This fabric is a mix of poly, wool (! ), and elastane, which makes it a warm (thank you wool), water resistant (poly), and exceedingly comfortable (elastane) knit fabric which is unlike any fabric I have sewn with before. It says it has only 10% stretch across the grain, but it turns out most of its stretch is with the selvege, which means it's actually a bit like a bengaline, and cutting the pieces out with that in mind meant I had more than enough stretch (the pattern definitely mentions using a stretch fabric on its instructions). I have seen fabrics like this used in higher end jacketing, like the kind you see used by North Face, L.L. Bean, Land’s End, and Patagonia. I am very thrilled that Fabric Mart was selling it and that I could have a few yards of it in the beautiful and bright parrot green color. So I had my fabric choice down, but I was stuck a bit on what coat to make. 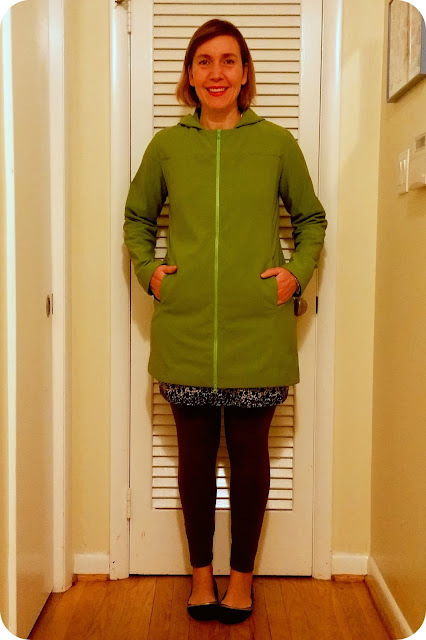 I loved the Jalieshort jacket I made last November, so when I remembered they had the City Coat pattern that included a hood, I knew I had found my new raincoat. I also loved the version made by my fellowFabricista, Kathy, so seeing hers I was doubly excited. 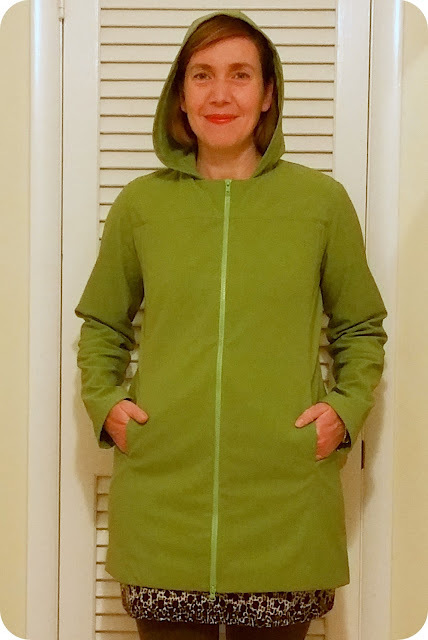 The actual construction was fairly easy, though I had a few moments of panic at the narrower 3/8” seam allowance. On more thick fabric like this, I prefer a larger allowance so I can have more space over on my sewing machine bed under the walking foot. I personally find it hard to watch the seam allowance under the foot and a couple of times, I noticed that the seam allowance would go from 3/8” to ¼” because I couldn’t keep track of its movement. I prefer 3/8” as a rule, for most things, but in this case a 5/8” allowance would have been better for the job. 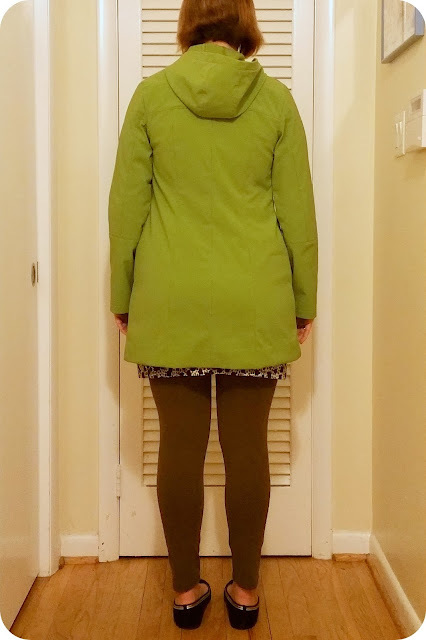 I also noted there was a lot of topstitching, but unlike my red coat I made last winter, this coat’s topstitching was a lot easier (thank goodness!). The biggest problem I found was the time it took me to trace, lay out, and cut out the pattern pieces. 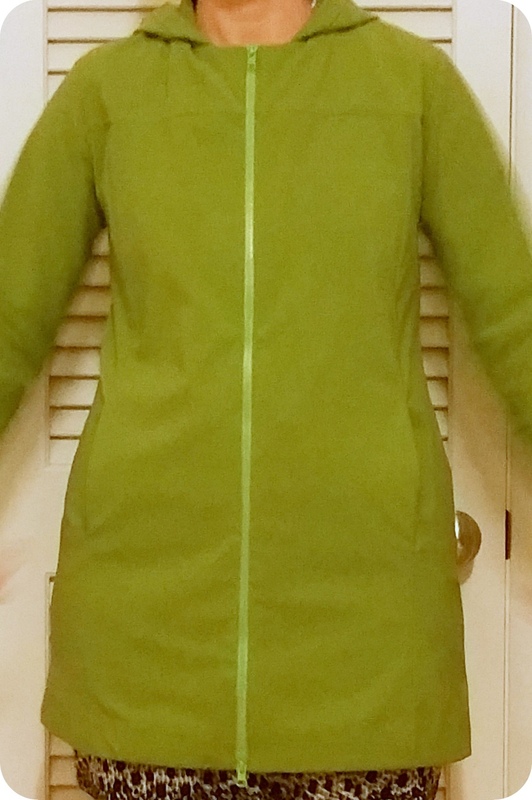 And because I underlined the coat in a poly stretch satin, I had to cut out those pieces, too. The seaming makes the fit amazing, though, so it is worth all the time, but I was sucked into the vortex of pattern cutting for a really long bit over the past few weeks. 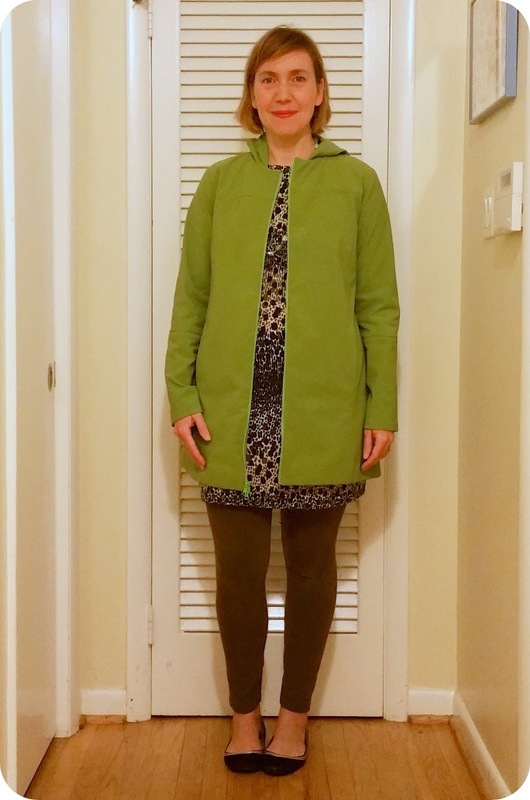 I initially intended to create the whole coat on the serger, but in the end the sewing machine served my purposes just fine. I still had plenty of stretch, even using a straight stitch (I made sure to gently stretch the fabric as it went under the needle). To make sure the stretch was in the hem, I hand-stitched that with great success and it is very stretchy. I think the pockets could be potentially very tricky, but I think if you can see the pattern pieces as a puzzle that fits together, it will make them easier to attach to the body pieces and to each other. I wouldn’t say the directions are especially good at guiding you through the process. They are fine, but I used my spatial abilities to help me there. The sizing was interesting. With my short jacket, I had to use one size at my shoulders and bust, and another at my hips, but I was very nervous that the size I picked for my hips and bum on this coat would be too tight. I went with an S at the shoulders and bust, sized out to a T at the waist, and out to a U at my hips and bum. Those were perfect! Now, I chose not to make buttons and buttonholes, so I didn’t have the same center front as would have been on that version, but the difference would be off only a bit, so I think I chose the right size, even if I had chosen the button closure. The zip is a double-ended zip, which is my most favorite to use, since I can unzip from both ends for comfort. I used a 30” lime green one, and it works, even though it clearly is a brighter and more citrus version of a green. Speaking of color, I adore this apple green color (or grass green or parrot green). I think it is one of the best colors for my coloring. I wear a lot of these bright, clear colors, and so I think I truly am a clear spring, which is one of the seasonal types, for those of you out there who like learning about things like that. It also means I can’t really wear the dusty lavender colors, but that’s fine. I’ll admire how good that color looks on other people. I wore it last Thursday, and it was a success. The hood kept the wind off of my head. The underlining and the warm layer of wool kept me warm. The elastane meant I could put it on and take it off without a struggle. And as far as water resistance? Well, it was sunny today, but when pressing it (btw, a challenge with this fabric, it didn’t really like being pressed! ), many drops of water got on the fabric’s right side, and they just beaded up and could easily be brushed off by my hand. It was cool. Like a science experiment. I know it will do well in rain. Have any of you made anything from this kind of fabric? I would love to know what you’ve made. I have a coworker who also loves this color and I have a bit of the fabric left and I really want to make her something. Maybe a rainhat? Have a great day! Stay dry! So cool to see this made up - I've been planning to make this same coat with this same fabric! I made this coat in a fleece powerstretch it is warm and waterproof. I love your version, especially with the zip! What a fun color and PERFECT fit! Super cute coat, and yes, that is a fantastic color on you! I think a rainhat would be a great gift for your coworker. I made a raincoat from this too, and am really impressed with how great the water sheds from the surface. I plan on making this with Polartec Powershield, Can't wait! Love it!! The fabric and shape of the fabric look good and I love the color!! Perfect coat for a brisk fall day!